Doctor Strange's Sanctum Sanctorum in Greenwich Village. I have always adored this house. 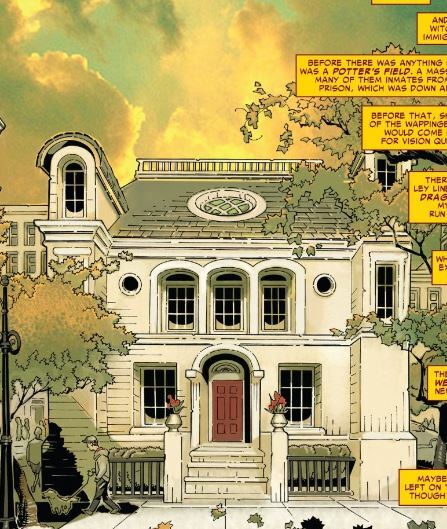 During the time of the first Marvel Civil War Doctor Strange saw it fit to disguise the house with a spell that made it look delapidated. Complete with a big, ghastly sign that a Starbucks would eventually be built on the premises. I just hated that image. I mean, look at how gorgeous the house is. 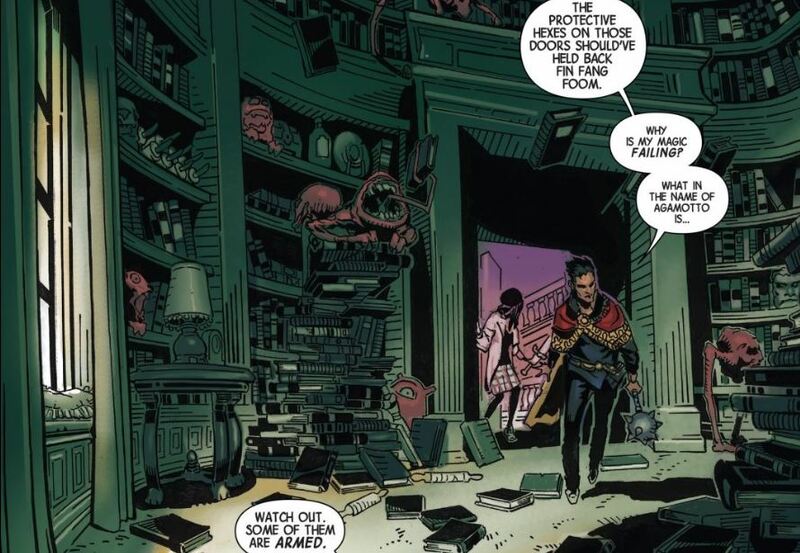 Read Marvel long enough and you'll have many occasions for visiting the Sanctum. 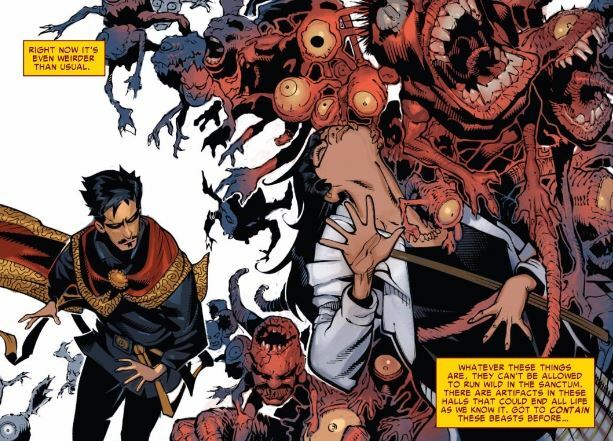 I've been inside numberous times in the pages of The Defenders, Marvel Fanfare, and, of course, the past Doctor Strange series. Even so, I am delighted at what happens here next: we get a mini-tour of one of the most interesting residences in Marveldom! Immediately past the main door. Typical cluttered Victorian room except that things are floating around and there's an inordinate amount of books and we're not even in the Library yet. 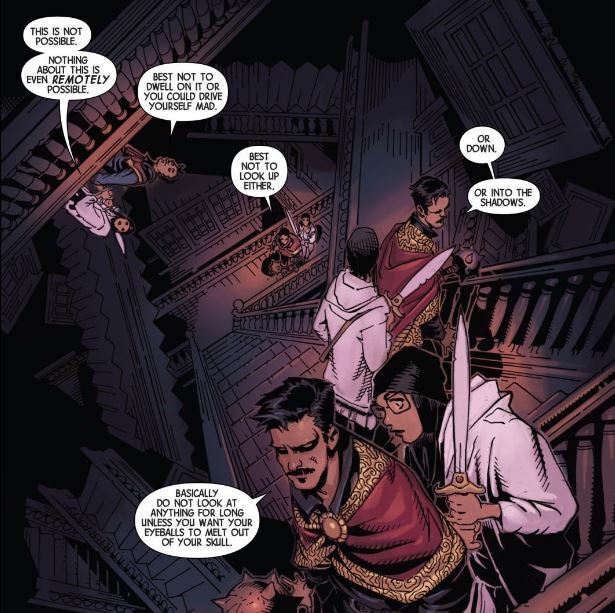 As you can see, by the time the pair make it to the Living Room, Doctor Strange has given Zelma a sword, quite the statement about his house. The Living Room is also a hybrid between a regular house (the walls, the furniture) and an obviously magical place. Not only flora but fauna can be seen rambling around this spacious room. Also of note is that it's broad daylight outside but the moon is shining through the Living Room window. I love the 'mustache' comment. The Bathhouse is done in a classical Roman style but that's were it ends, Doctor Strange makes mention that the waters are toxic - how does he use it for bathing then? Ghost healers. Beautifully creative. 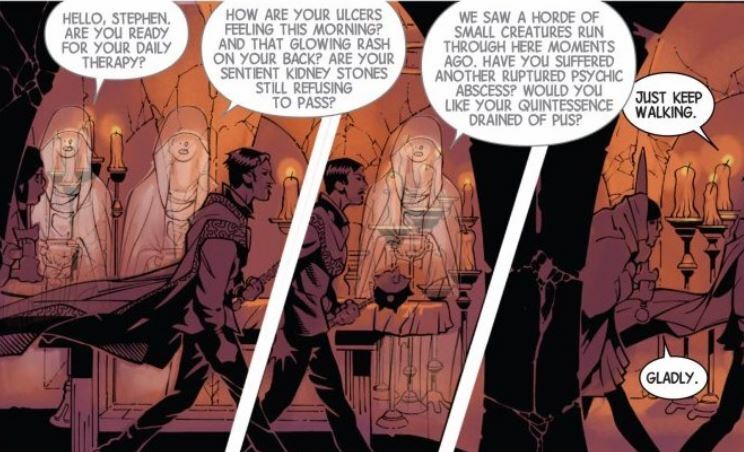 Hmmm, the Doctor has sentient kidney stones. 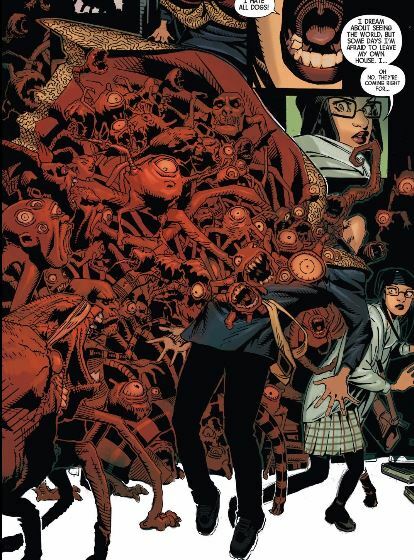 By this time the sheer weirdness of the Sanctum is getting to Velma. Ok, from the creativity of the Infirmary we go to this staircase. Satisfyingly grandiose albeit normal looking but it is the books that are not normal. Now one of the things that Strange cautions against is the simple act of opening a door within the Sanctum. One such door is indeed opened during the course of this issue by Velma. It opens into a grisly, apocalyptic world full of cannibals. Can you imagine the stench? Again fairly normal except for what's cooking. 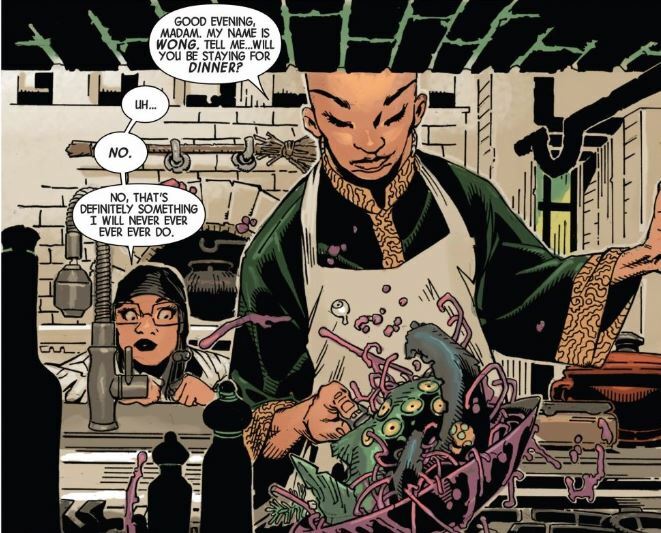 The cook is, of course, Wong. 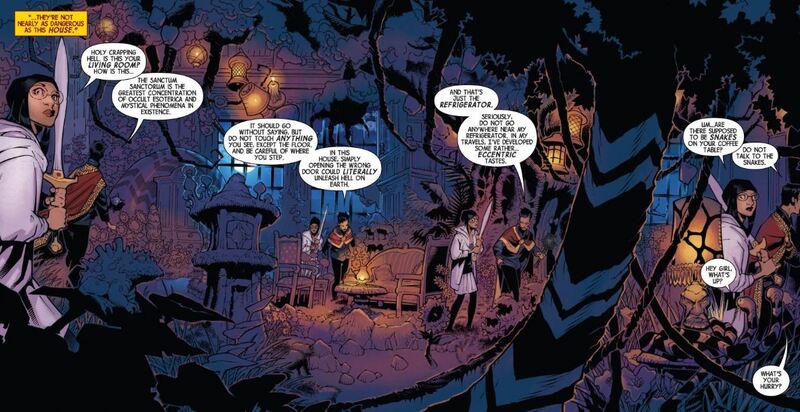 Refreshingly, in this series, they are dispensing with the master/manservant relationship between Wong and Strange. Little things like Wong calling the Doctor 'Stephen' instead of 'master', for example. Yes, this is a welcome change. 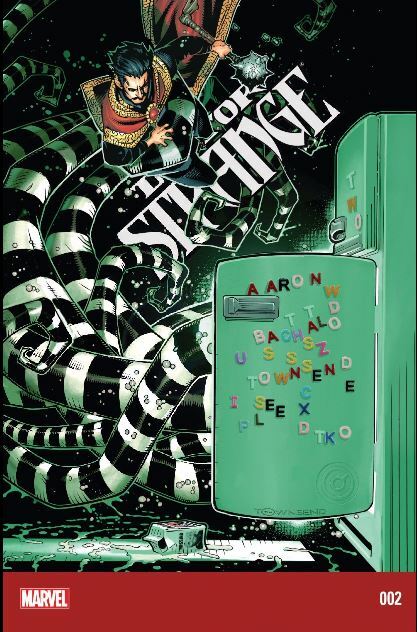 In later issues this will be reinforced with Wong making plot moves on his own instead of just being Strange's 'sidekick'. Going back to the food, it will be explained later in the series why exactly this is the kind of food being cooked in the Kitchen. It is the Strange kitchen after all, but that's not the explanation. 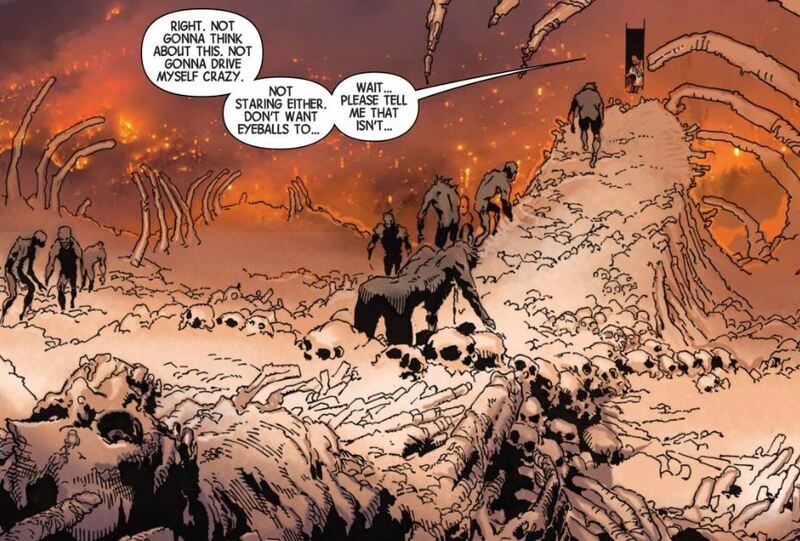 Its been great to wander around the Sanctum but now let's get back to where we left off from last issue. At the time, the weird growth on Velma Stanton's head literally exploded. It turns out that these are mystical parasites and the 'explosion' is these mischievous/dangerous critters escaping to run amok around the Sanctum - the inherent nature of the Sanctum and these goblin-like creatures (gremlins?) make for a bad combination. They haven't completely been cleansed from Zelma though - she still has that disgusting thing on her head. Mention has been made about the books in the Library being supernatural. Here is an example of that. The Grimoire of Watoomb, its power derives from the Temple of Watoomb located deep in the Indian Ocean. For a time, the Doctor will display these weird growths but he mentions that his mind is unassailable to these creatures. Since they live by siphoning psychic energy they will eventually die. Interesting enough, but the Doctor makes it more so by mentioning that his other parasites could also end up eating these new ones. 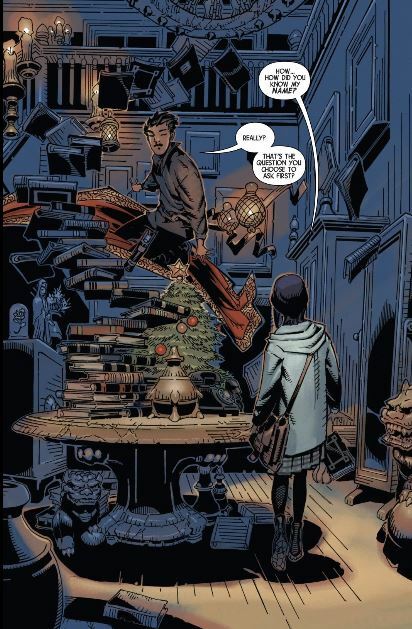 I think that it is momentous that at this point the Doctor makes an offer to Zelma to help with the Library seeing as how she's a librarian. 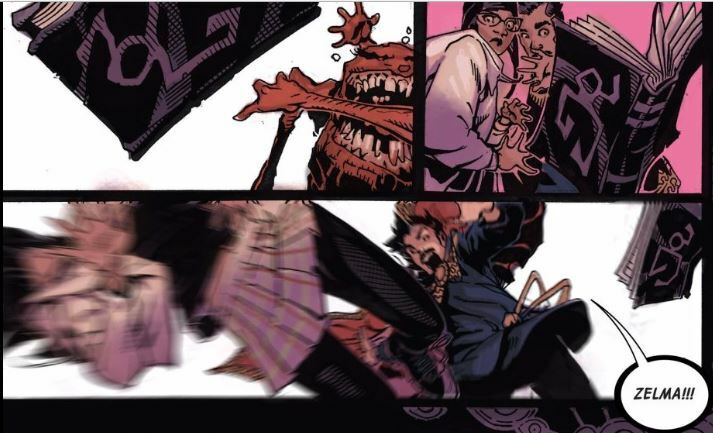 She accepts the part time work and I'm happy for that because I've grown to like Zelma and she expands the regular crew for this comic from just Wong and the Doctor - which is pretty sparse - to a trio.